Impressions and tips on Open Source, JVM, Clojure, Vaadin and Liferay. One big change that Activiti has introduced over jBPMv4 was to forego Hibernate ORM and use MyBatis. MyBatis is simpler and cleaner to use, but - it does not provide simple interface to perform queries that are not defined in annotations or XML files. with relative ease, there are still some limitations to the API provided by Activiti Service classes (e.g. you cannot add IN clause for task assignees). One thing that you can do, is to just skip Activiti interface, and access database directly. Surely it will work, but such approach has many downsides - you will be fetching information about Activiti processes in two different ways, you will have to map data to Activiti objects yourself, and so on. What we have managed to do for Aperte Workflow <-> Activiti integration (in version 2.0, where API is a bit more demanding), is indeed a hack. It is not as elegant as constructing query for jBPM, but still is quite simple and manageable. It propably can be done with Spring in a similiar fashion, or with SelectBuilder - but the principle is similiar. 1. Enhance Activiti's MyBatis mapping file - by adding our own version in a different package. <!DOCTYPE configuration PUBLIC "-//mybatis.org//DTD Config 3.0//EN"
The entire mapper file can be downloaded here from Aperte Workflow's github repository - core/activiti-context/src/main/resources/org/aperteworkflow/ext/activiti/mybatis/Task-enhanced.xml. Please note, that we are also exposing CommandExecutor object instance to access DbSqlSession. The technique presented here would be unnecessary or much simpler if Activiti would provide external means to configure MyBatis. Maybe that is a thing, that will be available in the future versions of Activiti. Still, even at this moment, it is fairly easy to enhance/alter Activiti's behaviour. I haven't seen any final classes (a common sight in Hibernate - e.g. org.hibernate.impl.SessionImpl) and the internals of Activiti are quite simple to understand. Vaadin is an Open Source widget-oriented, Java Rich Internet Application web framework, which allows programmers to develop browser-based user interface entirely in Java - server-side. That's it. This is what makes Vaadin different and this is what is game-changing in comparison to almost any other popular web framework. Apply Java programming patterns (compile-time polymorphism, inheritance, etc.) to all of your code - and build your application from coherent modules using these patterns. Vaadin still allows programmers to access the browser side - but in a controlled way, using Add-ons - Vaadin Add-on Directory provides ecosystem for those. And for most applications - you can easily build them using just the standard ones, provided by Vaadin out-of-the-box. JVM itself would be enough, but Vaadin is not only great in the idea itself, but also in implementation. The applications have eye-friendly look out of the box, you can also apply custom CSS and themes easily. The UI is well-optimized even in comparison to client-side only frameworks - and it works on all modern browsers out of the box (IE6/7 - with some downsides too!). There is even mobile device support with Vaadin TouchKit, Vaadin also supports JSR168/286 portals (e.g. Liferay Portal) and even Google App Engine. Aperte Workflow is an Open Source BPMS - the application that eventually is built during the introduction on BPM-class system to an enterprise. Aperte Workflow is designed with strong emphasis on modularity, re-usabiliti and extensibility of solutions created. User interface in Aperte Workflow is built on Vaadin. 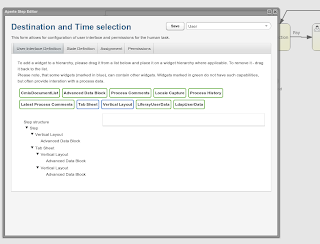 The approach for BPM task UI concept in Aperte Workflow is that for each human task, user interface is built from reusable blocks or components (in Aperte Workflow terminology: widgets). Such components can be process-aware (e.g. display process instance data) or just organize other components. With Vaadin, creating these components is a blast, even for someone new to the concept. You just code your component in Java - implementing some interfaces or extending ready-to-use classes. Vaadin widgets are there - so, for example - you don't have to worry on how to implement your own or incorporate existing suggesting combo box or grid - they are already here, well designed, optimized to work together with other combo boxes. So the code->deploy->test->code->deploy->... cycle is very short - and still we write our application in plain old Java. I wouldn't even attempt to try to implement such thing with pure GWT or JSF. Plugin mechanism provides integration with an Aperte Workflow web-based modeler - which is based on Signavio core, but more complex elements specific for Aperte Workflow were written in Vaadin too. Use of Vaadin in modeler allowed us also to engineer preview mechanics to some components (more to come) - for example, Advanced Process Data widget, which provides generic-form feature (it's just one plugin, not an obligation or part of the Aperte Workflow core - you can use, you can replace it, or you can use other implementation, or just go with your own plugins) generates preview in real-time. 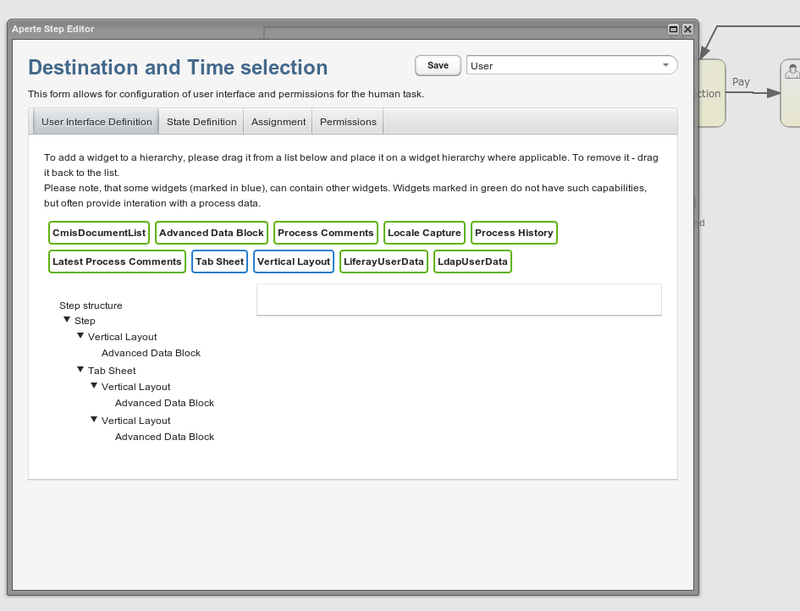 And the preview is the same code and configuration that will be run in the real user interface for a real BPM task. What else Vaadin has allowed us to do with relative ease, is that Advanced Process Data Widget provides JSR223 scripting support - for validation and manipulation of the configured form. In Aperte Workflow, we have chosen Vaadin as our UI framework, not only to save ourselves from spending too much time coding the user interface. We have chosen it mainly because with Vaadin, it is possible to create much more modular RIA web application than with any other framework we have seen. Will Aperte Workflow be possible without Vaadin. Sure - but with much bigger effort and budget. And the result would be underwhelming without Vaadin - or we would have created our own, imperfect implementation of Vaadin. Aperte Workflow - why another BPMS? Aperte Workflow is a BPMS (Business Process Management Suite) designed and developed by BlueSoft. The project has started in 2011 and is currently approaching version 2.0. BlueSoft is an Independent Software Vendor specializing in custom, tailor-made IT solutions for the enterprise customers - based either on Open Source or proprietary software. The company itself comes with over 9 years of experience in developing such solutions, which gives a certain perspective on how things should be done. But still, young enough to be able to innovate effectively. Why build another Open Source BPM solution? That is a good question, and we ask it ourselves every time we forego existing, available technology and start creating something new. With Open Source BPMs and Aperte Workflow, the decision came from a simple observation: that every time you need to deploy a BPM-based solution (be it Open Source or commercial software) in a real application, which provides real processes, used by real users, you need to build an application around it. Integration with Customer's authentication/authorization mechanisms. Custom User Interface. Forms with text, number and date field are great, but usually the business requirements are much more complicated. Integration on the browser-level with Customer's intranet portal (desktop based BPMS in my opinion are a total misunderstanding) - or some kind of base for BPM application. Enterprise integration with the Customer's other IT systems (CRM, ERP, ...). And yes, it is possible to build such solution yourself. Integrate existing technologies into one solution, learn how to use them, find bugs in your code and in the code of the technologies you are using - and then, finally you can start developing your processes. This is exactly what Aperte Workflow provides - a ready-to-use, well-tested and mature product, which provides a platform or a placeholder for your processes and custom mechanisms. Done right, with reusability, scalability and performance in mind. We do not aim to it be a complete solution for your business process (although it is very easy to build one with Aperte Workflow!) - we understand, that every process in every company can be a little different. But, there are some things that have to be done for every BPM deployment, so why not do them once and right? For us, Aperte Workflow is different from the other solutions, as it approaches problems on a different level. We do not try to provide an answer to every problem that rises during BPM deployment in an organization - but rather to provide means, that the solution will be worked out easily and will be coherent with other parts of the deployment and will be re-usable in other areas. Aperte Workflow provides common things that usually have to be built when deploying BPM in an organization. But, since this is a standalone product, even more features, that wouldn't be usually implemented in a custom BPM deployment are provided. Aperte Workflow integrates with JSR168/286 compliant portals (e.g. Liferay). By doing so, you do not only have an awesome integration with existing portal or enterprise IT infrastructure (e.g. Active Directory, NTLM, ...), but you also have a place to introduce and integrate other applications. Using JSR168/286 allows you to standarize and unify all your browser-based applications - into a one, coherent intranet portal. custom business logic - related to a certain process or organization, a CRM customer search form would be an example for that. The UI is provided by Vaadin, therefore its customization requires no HTML/CSS skills - it is programmed directly in Java. And with Vaadin, we can build beautiful, rich web interfaces with ease. Aperte Workflow allows users to build automated steps as plugins. As with User Interface, some of them can be quite generic (e.g. invoke Drools), others - very specific. All of them can be reused in different processes without any trouble. Also, Aperte Workflow comes with a sample plugin, that embeddes Mule ESB as an OSGi service. Other plugins can deploy simple Mule services, and processes can invoke them using Mule automated step. But - this is just a convienent sample of integration mechanisms and if for example ServiceMix would to be embedded as an integrated ESB - why not? Aperte Workflow's data model is built with JPA/Hibernate. That grants us significant portability with little effort, but also allows the plugins to provide their own data model without performance downgrade - the data model is mapped directly to SQL database. When designing BPM system from scratch, around existing BPM engine or solution, you usually have to configure process in two places - one for the BPM engine and the other for your customizations. Rarely you would take the effort to create a graphical, coherent tool to do that. But, as Aperte Workflow is designed for more than one deployment, such effort pays off. That's why we have taken Signavio Core Components BPMN2.0 editor and combined it with our configuration controls into one, complete, browser-based process modeler. How Aperte Workflow is built? Maturity from the start. We don't have to test, mature and grow our components. They are already checked by thousands of their users and built around their feedback. Much easier to learn. It is much easier to start using or diagnose a problem with a solution built from technologies you are already familiar with, or that have a thriving community around them. New features. If you are using your own software, there is a great chance, that all the features have to analyzed, provided, tested and checked by you. Aperte Workflow is great when it comes to building reusable components. Yes, many processes may differ, but building blocks for them can be re-used many times. Some of them, such as simple form displaying/editing process attributes or comment input form can be universal across the whole world, other - can be universal only in a specific organization - for example CRM customer search form would be applicable to many processes but only in current organization. Ganelon tutorial, part 2: widgets and actions.